Celebrate Heart Health Month: Which Oil is best for your Heart? 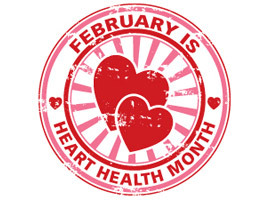 As I’m sure you’re well aware of by now, February is Heart Health Month. With all of the attention given these days to having the perfect figure, many people lose sight of the fact that the ultimate goal is not only to have a trim physique but also to have a healthy body, inside and out. Heart health is often a subject that gets ignored by most people when they are only concerned about the amount of calories and/or carbohydrates a certain food has. However, Cardiovascular Disease still takes the lives of 2150 Americans each day. (heart.org) One huge contributor to cholesterol levels are oils. Whether you’re cooking a dish, making your own salad dressing or baking some sweet treats, the type of oil that you use can have a direct impact on your cholesterol levels. So, how do you know which one to choose? Here are the top 3 most common oils and how they can affect your HDL and LDL cholesterol levels. Olive Oil: In recent years, olive oil has gained in popularity, mainly due to its heart healthy properties. Because of its mix of antioxidants, olive oil can lower your LDL (bad) cholesterol without changing your HDL (good) cholesterol levels. Coconut Oil: Although there is still a lot of research out about the exact health benefits of coconut oil, there are some general conclusions that tend to be the same across the board. As we’ve touched on in previous articles, coconut oil is becoming hugely popular (and controversial) due to its touted benefits. It appears that coconut oil does increase the levels of HDL (good) cholesterol in your body. However, it may also increase the levels of LDL (bad) cholesterol. So, do the pros outweigh the cons? Vegetable/Canola Oil: Vegetable oil has long been a staple in American pantries. It’s the most commonly used cooking oil. Canola oil has only 7% saturated fat and works to lower your LDL cholesterol and raise your HDL cholesterol. That’s really a good combination. Although there are many choices when it comes to cooking oils, it’s always important to remember that different oils will impact your overall cholesterol levels, both good and bad. An increase in total cholesterol isn’t always a bad thing. What’s important to focus on is your ratio of LDL to HDL. If you are facing a serious heart problem like cardiovascular disease or other risk of stroke, it’s important to consult a doctor about how to manage your diet. However, if you’re someone looking to get your whole body in shape, not just your outside appearance, start by paying attention to your heart health. Are you a dietitian or educator looking to teach your patients about heart health? NCES offers a full line of heart healthy educational tools, including the “Busting the Myths about Fats: Saturated Fat” and “Busting the Myths about Fats: Monounsaturat Fat” tear pads. Vegetable oils are so very bad for you. Highly processed including the use of chemicals. Same goes for seed oils. Check out David Gillespies Big Fat Lies for more information, including the history of these oils and margarine.